Mango Fruit Punch has an amazing smell when you first open up the package. It smells strong of mango, pineapple, with a touch of citrus and reminds me a lot of a fruit punch concentrate (the iced one that comes in a can). 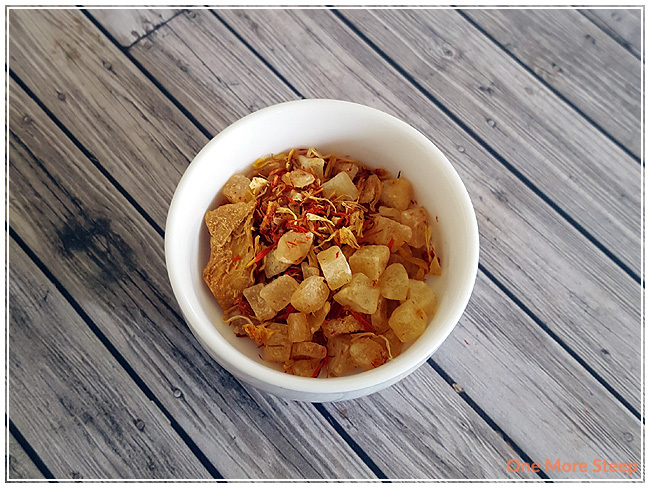 You can definitely see the pieces of fruit in this mixture and it smells so good! The problem that I do have with Mango Fruit Punch is that because of all the fruit, it is a bulky and heavy fruit infusion. I had bought 26g of Mango Fruit Punch and used about half of it to make a pot of tea (I use my Tea For One), which means that each cup is fairly expensive. The ingredients in Mango Fruit Punch are: pineapple, mango, orange peel and slices, tangerine, safflower, marigold, strawberry, and artificial flavouring. I don’t smell the strawberry, but I do smell most of the other ingredients although mango really overpowers the pineapple. 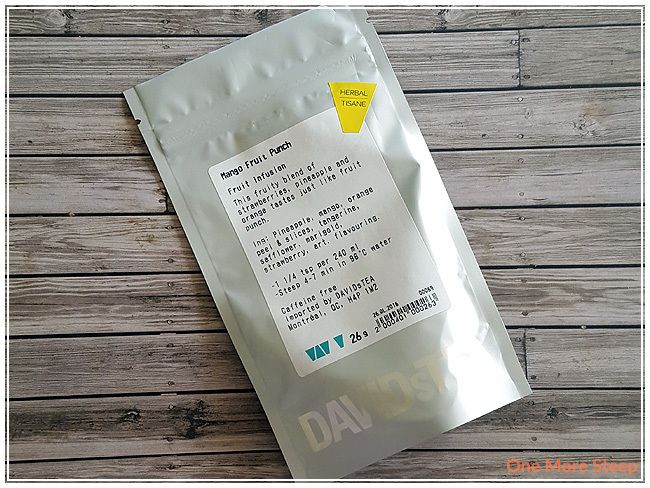 DavidsTea recommends steeping Mango Fruit Punch in 90-95°C (194-203°F) water for 4-7 minutes, as per their website page for Mango Fruit Punch. On the label that was printed for my bag of tea, it was 96°C water for 4-7 minutes. I steeped mine for 6 minutes. Mango Fruit Punch steeps to a bright yellow. First off, I would recommend steeping this with a tea filter as I had used the metal basket infuser from the Tea For One and many small pieces from the fruit infusion wound up in the tea. Mango Fruit Punch smells strongly of mango, pineapple, and oranges. 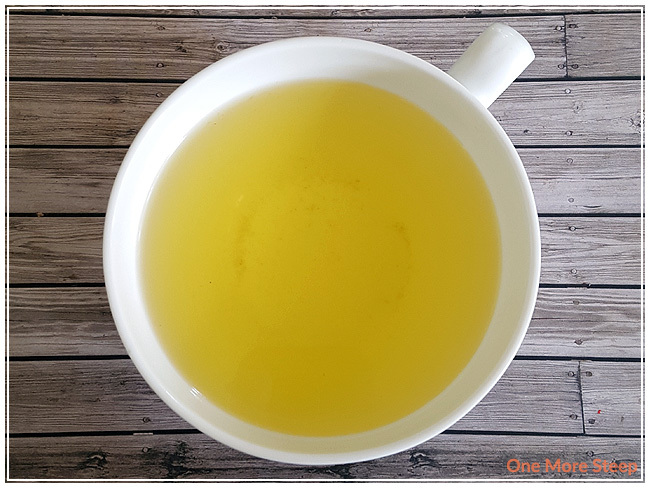 There’s a tartness to the taste of this fruit infusion, and there’s a mild sweetness to this tea that goes well with the mango and pineapple taste that is very much present in this. The orange isn’t as strong, which is a little disappointing considering I can smell it. There’s this watery juice quality to this tea, like if you were to take a carton of juice and mix it with some water to thin it out. While the flavours are there, I don’t really like it hot (this may be because I also do not like warm juice). I cooled the rest of the tea in the fridge and found that it makes a delicious iced tea. I did not resteep Mango Fruit Punch. I thought that DavidsTea’s Mango Fruit Punch was just okay. While it tastes great and makes a fantastic iced tea, I do think it is expensive given how heavy the tea is and how much you need per pot of tea. That said, Mango Fruit Punch is delicious and I think it would make for a nice iced tea treat, if you wanted an iced tea for special occasions. The tart and sweetness to Mango Fruit Punch makes it delicious to drink, and I would definitely recommend making it an iced tea rather than hot.